I didn't bring my laptop to school today because I was too tired this morning to pack it up, so I didn't think that I would be blogging. Well, I read something on Ryan's blog that made me laugh (as usual), and I couldn't resist posting it. It's funny because it's so true. The teacher took a CD player into class and we listened to that as I stood there watching it. We did this for two of the classes, then in the third one the CD player wouldn't play. At first I thought the CD player picked up on the sheer stupidity of the situation, having a foreign native English speaker standing 10 feet from this recording of native English. Anyway, it wouldn't play so the teacher panicked. We delayed class for about 10 minutes while he played with it. I knew what he was doing, but decided not to say anything. For some reason, after lunch he became stupid. He would press play, then fast forward to the track, then press stop rather than pause. Over and over again. Finally he turned to me and said in a sweat, "What are we going to do, the CD player won't work." Please understand the CD was only a recording of the actual text. Nothing special. The text I have in my hand. So the only logical thing for me to say in return was "It won't work? I don't know what we can do." This went on for about 5 more minutes until one of the bright students, or rather one of the students who would actually speak in class, spoke up and said "Ryan sensei could read the text." Finally the teacher looked at me and then the CD and then at me again and asked politely. I said "I will try, I'm not very good at reading and speaking English, I have only been doing it for 30 something years." He looked confused so I started reading. That's like asking a motivational speaker to come to your job and then playing a DVD of them rather than having them actually speak. I think there has been some confusion. I LOVE the JET program! Living in Japan is an adventure. I would highly, HIGHLY, recommend the JET program to everyone with a college degree. I may complain a lot about my particular situation, but we have a saying in the JET program: ESID, Every Situation Is Different. It's true that I'm spending more than my fair share of time in the barrel (that's part of my CBS; it is, in fact, what CBS means), but virtually all of the other JETs I know are having a great go of it. I'll put this at the beginning of the title for posts which deviate from my more pedestrian (and less interesting) journal entries (i.e. the "what I did today" posts). This way you can just skim the titles until you see NJ: and won't have to waste your time reading the boring stuff, and I won't have to spend extra time composing posts whose sole intended audience is myself. Everyone wins. Until Blogger implements categories, this is the best I can do (short of running my blog on my own server; what I should say is: this is the best I can do with the least amount of effort). 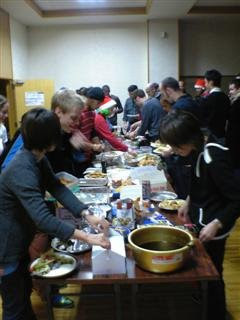 Here in Japan, every Junior High lunch comes with a bottle of milk (an actual glass bottle; trying doing THAT in America! ), the size of which is standardized. So some companies make mixes that can be added to the milk and sell them in small packets sized appropriately for the bottles. A while ago we had coffee flavored mix (in Junior High...), and there were packets left over (I guess some students hadn't acquired the taste for coffee yet; give them time, they're only twelve). Today, of course, I mixed the coffee flavoring into the milk I used in my coffee. To recap so far, I've made instant coffee using coffee instead of hot water, and now the sugar and milk is replaced with sugar and coffee flavored milk. It certainly passes the spoon test (the spoon test is where if you have a spoonful of your coffee, you can't see through the coffee to the spoon; I may have to change this to: if you put a spoon in your coffee, it stands up). So, I need to lose weight again. Is it because I stopped exercising during NaNoWriMo? Is it because it's winter and human beings generally gain weight at this time? Is it because I've taken to eating nothing but microwave pizza with extra cheese? Of course not! It's all because of Festivus, which we celebrated this past weekend. That one day of eating lots of turkey and stuffing is surely the sole reason I have gained five pounds. 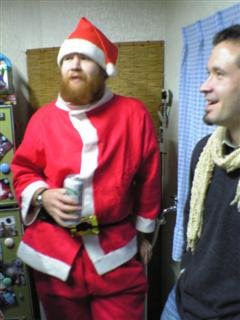 After Festivus, fellow Asahi JET Lewis hosted the after-party, where I got to meet Santa! The picture may look a bit blurry, but actually it was Santa himself who was out of focus. I blame the stress from his work at this time of the year. I also took some video of people playing an EyeToy game, but my lame phone records the audio in an obscure codec, and I'm not motivated enough to convert it. I go back and forth between two extremes of what I want my blog to be. Originally, it was my journal, a place to store my random thoughts to get them out of my head and lock them up in electrons where they couldn't hurt anybody. But then, unfortunately, people started leaving comments. Of course, this was because I put the ability to do so on my blog, so the fault is mine. Having the ability to leave comments is just the Thing You Do on a blog. However, if it were up to me, comments would be treated more like entries (people could edit their comments, leave comments on other comments, etc, but I digress). So, now I think about what I write. If I ramble, it means that I think my thoughts are more important than your time. You won't know if my thoughts are crap or not until you read them, and that takes your time, whereas if I took MY time in the first place, I would reconsider writing such crap posts. Which means that either I post streams of consciousness that my not be relevant (or even coherent), or I don't post at all (not to say I can't think of anything to write, or don't have fun stories to share; I just second guess myself out of posting them). I'm still trying to find the balance. This isn't a whiny website at all compared to some I've seen (in fact I rather liek it). There was one I read a few years ago in which a guy was complaining about how there was no McDonalds in his town, and the third time he mentioned it in one page he had to qualify it with "It's not that McDonalds is that important to me but it just shows my isolation"! THAT was truly the king of whiny websites. I'm grading papers, and the question was: Why was Hiroshi surprised when he ordered curry at a restaurant? The answer was: Because there wasn't a spoon. And I thought of The Matrix. Well, I've found new motivation to lose weight. Today in class, the crush (you remember her, right?) came up and demonstrated a new word she learned: HUG. I don't know who keeps selling her those English phrase books and dictionaries, but they must be stopped. Anyway, she put her hand on my stomach and commented on how big it was. And then she got the other kids to say it too. So now my students call me "big belly", and if being mocked by middle-schoolers isn't motivation enough to start losing weight again, I don't know what is. So, today was another "Here's the lesson plan, but you run the lesson" days. I was given the lesson plan and instructions to run the lesson approximately 10 minutes before class began. So plenty of time, there. Grr. Anyway. Words fail me as I try to describe in text the behavior of the students that period. Here's as close as I can come in one sentence: "In America, children that disruptive would not be allowed to come to school, period." There were a few particularly disruptive students, and the other students around them followed their lead, resulting in a situation where almost no learning was taking place. If I were not an ALT, and it were truly my class, I would have asked those students to leave, or sent them to the principal's office, or smacked them in the head with an eraser (grrr). However, us ALTs are specifically forbidden from disciplining the students in any way (probably because some ALTs in the past could not refrain from choosing action #3 above). And the JTE, the only one in the room that had the authority to discipline the students, wouldn't. Not that you care, here's an update on my financial situation. Item 3: Enter your permanent home address (number, street, apartment number, city, state, zip code). If your mailing address is an RFD, post office box, or general delivery, you must list both the street address and mailing address. Item 4: Enter the area code and telephone number for the address listed in Item 3. If you do not have a telephone, enter N/A. I entered my permanent U.S. mailing address on line 3, and since I don't have a phone number for it, I entered N/A on line 4. EXACTLY how the instructions told me to. This is the part that they said was wrong (said ON THE PHONE was wrong, when I called, because as I said the letter has still not arrived). So, we'll see. I may still need a lawyer. I wonder if I can sue for emotional stress? I mean, my hair IS falling out (I found out at the MYC that, despite what I read on the internet, not everyone's hair falls out when they come to Japan, and when it comes to Fukui, it's just me). My lifespan is probably measurably shorter now from dealing with this. They should pay. Second is the tax situation. A reminder: I'm paying 20% tax in addition to normal withholdings for health and social insurance. After everything is taken out, my take home is closer to 60%. This is because the Japanese government is requiring us U.S. JETs to file a form that says we are U.S. residents for tax purposes (form 6166). Well, it's just U.S. JETs, and it just started this year, so the kinks haven't been worked out yet. I found out that I'm the only one who is having so much taken out of his paycheck (most places haven't taken ANY out). So, with the winter break coming up (which everyone else gets off when the students are gone, but I don't, so I have to use vacation days, don't get me started), everyone else can afford to take trips and do things, while I get to spend my free time huddled in a blanket in my room, rationing what meager food I've managed to save up so far. Finally, some contracting organizations have been threatening to or actually withholding tax from JET paychecks until they turn their forms in. This is a contract violation and any JETs experiencing this are encouraged to contact CLAIR through the JET Line for help in resolving this issue. That's me they're talking about. I accidentally started a panic when I mentioned my situation in the newsgroup, thinking (erroneously) that others were going through the same thing I was. So, it turns out that they shouldn't have been withholding any taxes all this time. Sigh. Hopefully they won't withhold any more. I received a letter from the I.R.S. that certified I was a U.S. resident, but it didn't say 6166 on it anywhere, so we'll see in eight days when I get paid again. Sigh. And in the meantime, my bank account is in the triple digits and falling. Guess I don't have enough afterall to buy myself a PS2 for Christmas. My stats tracker tells me that I've been getting up to 20 unique IP address hits on this blog per day. Well, I usually come here to post, so that's one. Do I know 19 other people? Thomas posts comments, and Chelle did too, so that's two more. Hmm. Curiousity didn't kill the cat, but it did leave him sterile, so I should probably let it go. If you can read this: QUIT BROWSING THE WEB GO WORK ON YOUR PAPER! You know you're addicted to coffee when you see someone starting a pot, and you WAIT by the pot, watching it, so you're sure to get a cup (the coffee doesn't last long in this office). So, I'm still at work. I just finished grading papers, which is why I'm still here. I still have to do the English Bulletin Board, which is why I shouldn't leave, but I'm going to anyway. Unfortunately for me, I gave the assignment, so it had to be me to grade it. The second graders are learning "There is" and "There are" so I described my bedroom ("There is a table in the center of the room. There are books on the table..."), and the students had to draw what they heard. It was a pretty difficult assignment (intentionally on my part), but more than I expected got perfect scores. And some of the drawings were quite cute. :) Here's a picture of part of one (I should have scanned it, but that would have meant stopping grading and going to the other room. Snapping a quick picture with my phone was much faster). On the far wall are two posters. 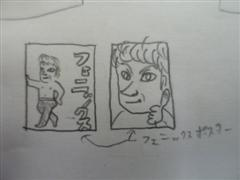 Most students just put squares with the word ポスター (poster in Japanese) on them. So, we're doing Beatles stuff here (I now know more about the Beatles than I ever thought possible; example: when John started a journal in '69, I know verbatim what the first four entries in it were.). It should be: "Imagine there're no countries" or "Imagine there's no country"
The problem with English is that it's so complicated. The problem with ME is that, now that I'm learning more and more what the rules are (whom vs who for example), I can't turn it off, mentally. Sigh. The song will never sound quite the same to me. I have, quite possibly, the worst chair in the building. I'm going to call it the scrub chair from now on. I really, really want to swap it for a really nice chair in the teacher's room that hardly anyone uses (that's probably why it's still nice), but everyone would see the difference. ON MY FACE, BECAUSE I WOULD BE SMILING. I know I probably mention this every time, but today was CURRY day for lunch! I love curry. Of course, it's different here in Japan than it is in America, but it's still pretty good. However, I made a terrible misjudgment. Usually, I try to eat with the students, but when it's something I don't think I'm going to eat much of, I'll stay in the teacher's room (I don't want to set a bad example by not finishing my lunch; the students are REQUIRED to finish their lunches). Today, I saw a bowl of vegetables and a plate of vegetables. I stayed in the teacher's room. D'oh! I didn't realize it was curry until it was too late. By the way, the plate of vegetables....was fruit and vegetables. Mixed. Apples, pineapples, pickles, cabbage, with a cottage cheese/mayo dressing. It was...interesting. I got myself a glass of water, and when I went to put ice in it (yeah, I know it's winter, but I'm wearing a sweater, cut me some slack) I saw that the cubes, which previously were normal sized for the tray, had shrunk. I also remembered that when I had placed ice cubes in the holding bucket in my freezer at home, they shrank there too. What's the deal? Growing up, we had the problem with the cubes GROWING as frost built up on them. Has the technology for freezers changed so much? So, it's still around the beginning of the month (my busy time, and I am brain-fried already), and in addition, I'm having a run of financial difficulties. The other day, I was going to go buy some new clothes (since, at the moment, I don't have enough to last me one full business-week (which is five days)). Before that, though, I stopped to drop off my two suits to get dry-cleaned. They weren't filthy or anything, and I hardly ever wear them but I hadn't had them dry-cleaned since I got them, so it had to be done. Along with the two suits, I took a jacket and a blanket (the cleaning place, of course, does non-dry-cleaning stuff too). Well, first I was told that I would have to pay extra for the black suit. Why? Because black is the official color of formal suits here. So, I have to pay extra. Just because. Then, I had to pay extra to get some special treatment to counteract sweat or something (I wasn't consulted about this). This extra treatment costs nearly as much as the dry-cleaning. In the end, what I thought was going to cost me close to $25-$30 (based on Internet searches for average prices). The actual cost was closer to triple that. I know, I know, Welcome to Japan. So, that wiped out my budget for new clothes this pay period. Next paycheck is still two weeks away, and I may run out of food before then, but anyway. It's an adventure. In similar news, I found out that I may be the ONLY ALT paying 20% off the top in taxes every month. I mentioned in an ALT on-line group that I still hadn't heard back from the I.R.S. and that ~$600+ a month was a bit much to bear, and I got e-mails saying "How much?!" I chocked it up to being a CHO-ALT (I work for the town I live in) instead of a KEN-ALT (working for the prefecture), but it doesn't look like the other CHO-ALTs have the same problem. Anyway, after a lot of searching, it turns out that my paperwork was filled out incorrectly, so I'm resubmitting it today, so in another month it should be taken care of. This will put it after this next paycheck, so I will have had 20% taken out for five paychecks, which is 100% of one paycheck. So, there's that. The biggest bummer about this whole thing is that I won't have any money this Christmas. Not for presents (I'm not into that whole 'presents' thing anyway; if I want something, I'll go buy it myself! If I can't afford it, I probably don't need it), but for travel. Originally, I wanted to go to the Tokyo region for the holidays, but since I'm basically living from paycheck to paycheck, and I won't have those yummy school lunches to live off of during the break, at this point I'm just saving up for food money. Happy holidays to me, indeed.